Children under three should not watch screens, a leading psychologist says. Dr Aric Sigman is warning that screens "may produce" an increased level of dopamine in children's brains. He suggests this could lead to a dependency on screen media when they are older. There are calls for more research to be carried out as there is currently no conclusive evidence on the effects of screen media on young children's brains. There is also growing concern around the world that very young children should not watch any screens at all. "80% of adult brain size growth occurs during a child's first three years, when they may be most vulnerable to the effects of screen media. 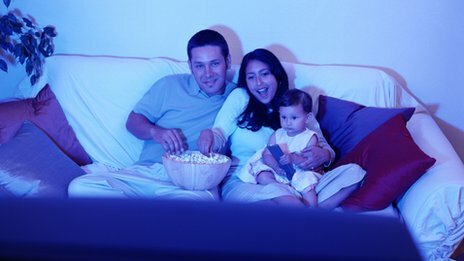 "There should be a buffer zone in the early years, whereby this stage of child development is "cordoned off" from premature exposure to screen media"
In the US, paediatric guidelines recommend that no child under two years old be exposed to any screens until more research is carried out on the possible effects. And the US first lady Michelle Obama, who campaigns to end childhood obesity, recommends curtailing screen watching for very young children. She said this could be accomplished by "limiting screen time for all kids but making sure we eliminate it for kids under two. "I know a lot of parents get shocked by that." France has already banned digital terrestrial TV aimed at children under three while Australia and Canada have similar recommendations and guidelines. "We know that early screen viewing is likely to lead to long periods of viewing for the rest of your life," says psychologist Dr Aric Sigman, who has written a paper for the British Medical Journal on the time children spend looking at screens. "The way you view screens when you are young are the habits you pick up for ever after it seems. "What's implicated in this is a chemical called dopamine, this may be the case, dopamine is produced when we see something that is interesting or new, but it also has a second function. Dopamine is also the neurochemical involved in most addictions, it's the reward chemical. "There are concerns among neuroscientists that this dopamine being produced every single day for many years, through for example playing computer games, may change the reward circuitry in a child's brain and make them more dependent on screen media." When computers and TVs first became household items they rarely had anything to offer small children. Now infant screen viewing is increasingly common and estimates say more than 90% of US children begin watching TV regularly before they are two years old. Baroness Susan Greenfield, professor of synaptic pharmacology at the University of Oxford, has been conducting experiments on rat brains to find out how the neurotransmitter dopamine affects large groups of brain cells. "Now we know quite a lot about dopamine, it has many jobs in the brain," says Baroness Greenfield. "Somehow it's related to arousal, addiction and reward in very subtle ways which will change the whole brain. "Now it's also believed that perhaps video gaming taps into this system. There was a study where it showed the area of the brain related to dopamine was actually enhanced in kids who were compulsive video gamers, rather similar to compulsive gamblers." Dr Sigman believes that the way to retain a child's interest is known by those making programmes for children. "Certainly, programme makers know this although they don't know the name dopamine," he says. "But they know that the more edits you put into a cartoon or a programme the more likely it is to keep a child's interest up to a certain point. "Providing a child with a lot of novelty may produce higher levels of dopamine in a child's brain, making the child seek more and more screen time to satisfy their need for more dopamine. "This is speculation at the moment but there are very good reasons to think that this speculation is correct." Dopamine is essential for both attention and addiction and Sigman is speculating that if screen viewing causes the production of too much dopamine in a child's early years it could cause dependency and attention damage in later life. 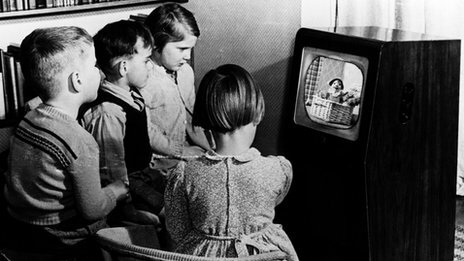 With recommendations that programmes for very young children should have as few cuts and edits as possible, it seems Watch with Mother and similar programmes of the 1950s may have had the right idea all along. But changing the way TV is watched with parents could have its benefits. "If a parent is sitting next to a child while they are looking at these screens and, let's say the screen says a word, and the parent says 'Look happy, the baby is happy' and points to it, actually a child can learn from that, even very young children, because there is social interaction," says research scientist Yalda T Uhls, of the Children's Digital Media Centre which aims to study children's interaction with the new forms of digital media and see how these affect their offline lives and long-term development. "At a certain age, screens actually can teach, once a child understands that the screen is a way to comprehend the world. "Children need to understand that this 2D flat screen represents their real world and that doesn't really happen usually until closer to two years so they are not really learning. "Without social interactions, screens at young ages don't teach anything." Different countries are reacting differently to studies done on children and screens. As recently as 2008, the UK recommended children be exposed to technology, computers and screens from a very young age. Since then the advice has been removed, but the UK currently has no medical or governmental guidelines. The BBC's CBeebies channel is one of the most prominent stations aimed at small children in the UK. When asked about the research, it said that although it accepted that younger children watched, its programming was aimed at children of two years and older. However, some of its programming implies that younger viewers are welcome, for example, the broadcasting of birthday cards which celebrate first birthdays. CBeebies says these are from parents and older siblings who want to celebrate the birthday of younger members of their family. BabyTV, owned by News Corporation, says it targets children up to four years old. Since it has been granted a licence to broadcast in the UK, EU broadcasting laws prevent other countries within the EU from banning it. They are however required to display warnings about the dangers of young viewing in France. 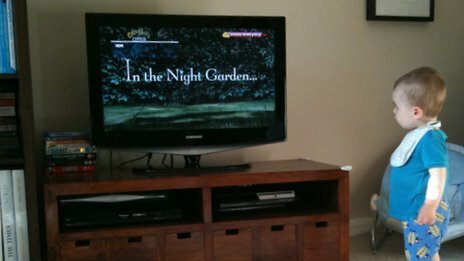 But a lot of parents admit that the TV can be really useful, particularly to occupy children for a few minutes. "A child that follows a parent around who's just doing the laundry, the cooking and just follows the parent around, versus the child sitting in front of the TV will learn more words at very young age." But the one thing that remains is a lack of conclusive evidence about the dangers - or safety - of very young children watching a screen for too long. "I think that what we need to do is to adopt a variety of measures," says Baroness Greenfield. "Surveys and trends are not experiments but no more was smoking and lung cancer in the fifties an experiment, but people started to see a link then eventually, epidemiologists come along and they establish that one thing may have caused the other." So while the jury is out on whether screen entertainment poses a serious risk to very small children, the advice from some government health departments, paediatric medical organisations and experts is to err on the side of caution for the time being and let the little ones snuggle up with a good book instead.